Mio’s made everyone some of her special omelette sandwiches for lunch. Tokacchi is especially excited. 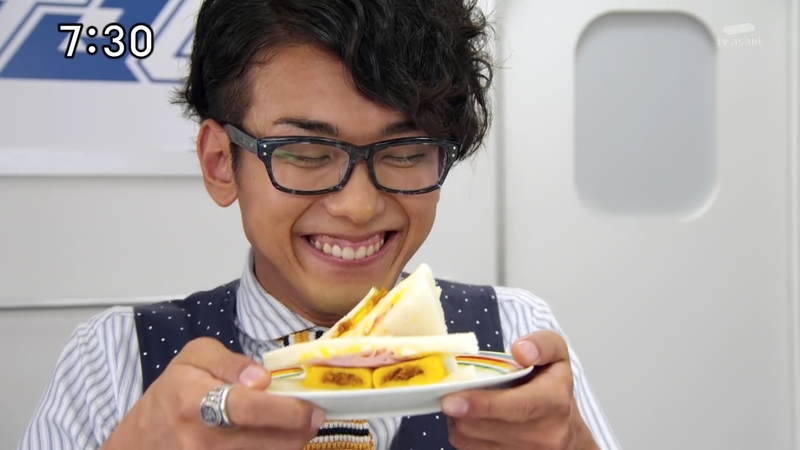 But he sees Hikari pick at his, not wanting to eat any vegetables, even the ones Mio’s put in with the omelettes. Mio encourages him to at least eat those. 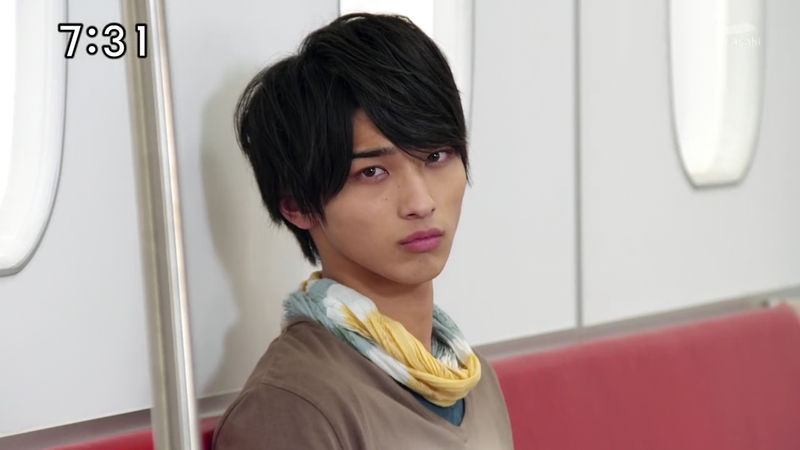 Appearing to be a little miffed by Hikari’s seeming unappreciation of Mio’s care, Tokacchi stands, turns and says. The others pause. “That’s true,” Kagura and Right agree. 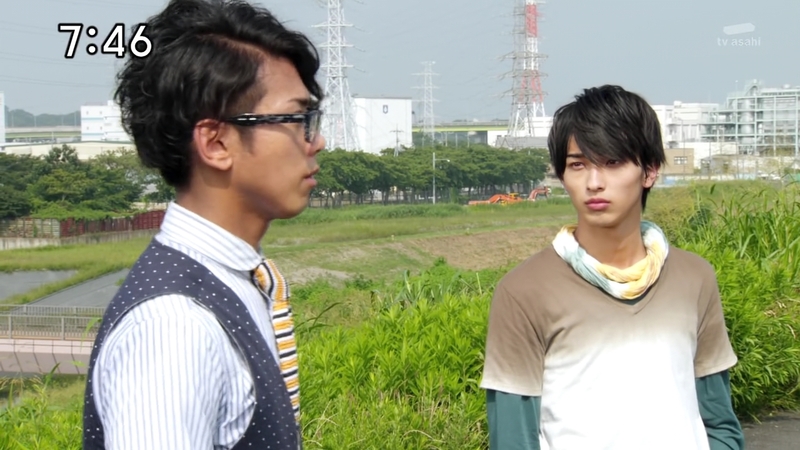 Ticket and Mio don’t understand what Tokacchi’s getting at while Conductor says he hates cucumbers himself. 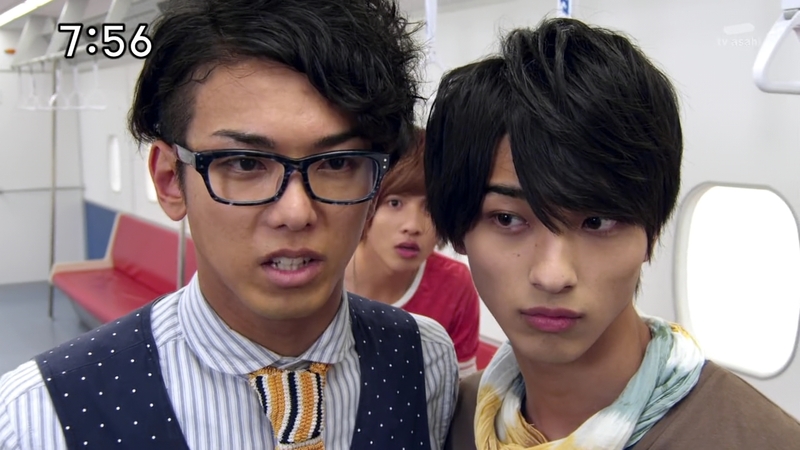 Hikari just looks at Tokacchi who then realizes he might have hurt Hikari’s feelings. Over at the Castle, Marchioness Mork announces that she will be moving in to fix the disorganization of the Shadow Line commanders as well as take care of the Emperor’s well being. Madame Noire leaves and Mork turns her attention to Baron Nero. She asks why he hasn’t taken care of Zalam and Schwarz yet. Nero admits Zalam has been very difficult, but Schwarz is no longer a threat. Still, Marchioness Mork orders him to take care of them, regardless. 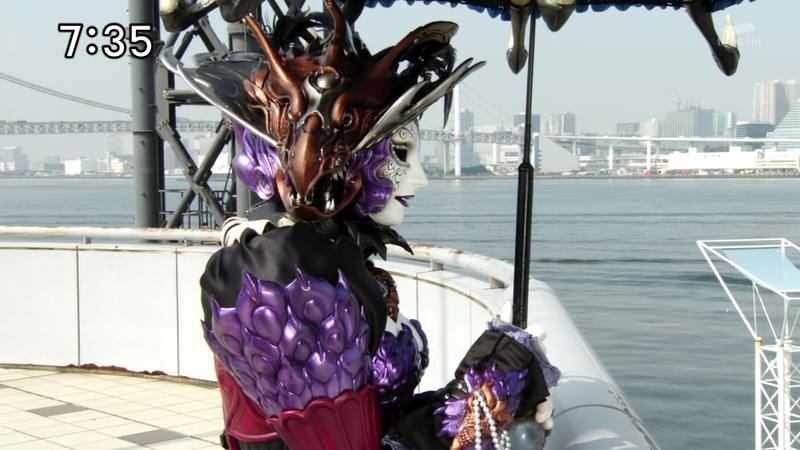 Madame Noire overlooks a plaza by the water in new town. She can’t believe Marchioness Mork has inserted herself at the Castle and is now treating her like a mere monster of the week. But she subdues her frustration for now and gets to some darkness making. She takes a feather from her hat and blows some darkness into it, causing it to replicate and attach themselves to various people’s heads in the plaza. The now-feathered humans start to get violent and proceed to attack everyone and every poor monobloc around them. Madame Noire laughs as Akira arrives, playing his harmonica. Akira henshins and Madame Noire summons a group of Kuros. Seeing the rampaging feathered people, Akira calls the others to hurry over. As Akira faces off with Madame Noire, a crying little girl is about to get a monobloc chair smashed over her head, but Right arrives just in time to save her. 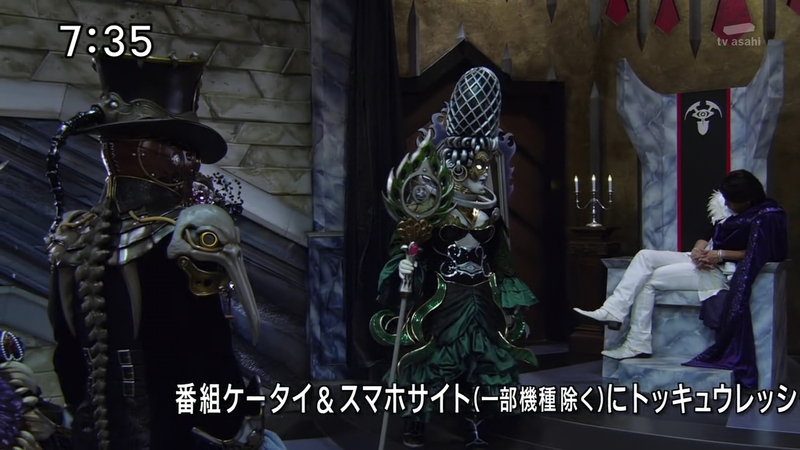 Right protects the little girl as Hikari and Tokacchi pull the feathered maniac off of them. Right tells the little girl to run and Akira tells the others to get the feathers out of the people’s head to break the hypnosis. More Kuros arrive and Mio decides to go straight for Madame Noire. She asks Noire why she is still serving the Emperor after what he did to her daughter. Kagura joins Mio and Noire says that is none of their business. Noire shoots at and easily sends the girls flying. Akira and Right take Noire on, but she leaps and sends a fresh round of feathers toward them. Right tries to get out of the way as Akira slashes at the feathers. But one feather instead attaches itself to the back of Right’s helmet. Oops. Akira apologies, but Right starts to rampage. He charges straight toward the others and attacks each one of them, especially poor Kagura. Hikari gets up and goes to slash at Right’s back as he proceeds to beat Tokacchi. But Hikari hesitates and pauses. 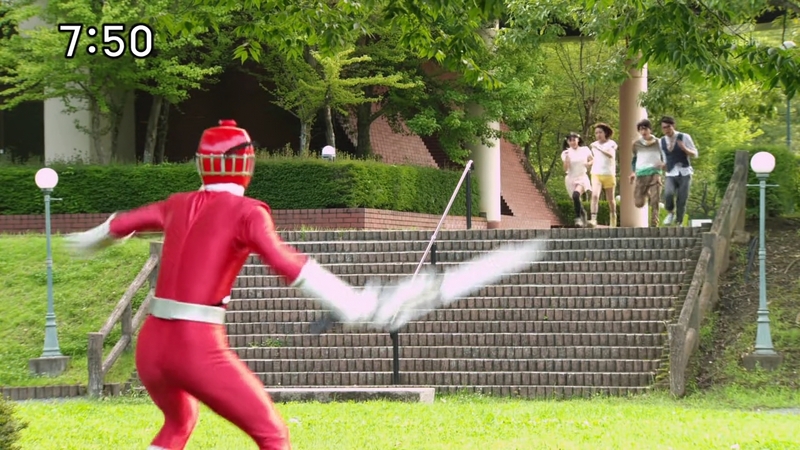 Right kicks him out of the way and Madame Noire laughs at the ToQgers fighting one of their own. Kagura says this is no use, they can’t possibly fight Right. But one person can. Akira charges toward Right and goes all out, feeling guilty for putting Right in this predicament. Akira doesn’t hold back and the others are worried Akira will go too far. They break up the fight and whisk Akira away, leaving Right with Madame Noire. Akira continues to blame himself and vows to make things right. This will be his place to die. He runs off. They hear screaming and remember that there are still other feathered people running amok, so they decide to split up. Mio takes Kagura, leaving Tokacchi with Hikari instead. Tokacchi still wonders if Hikari is mad about this morning. 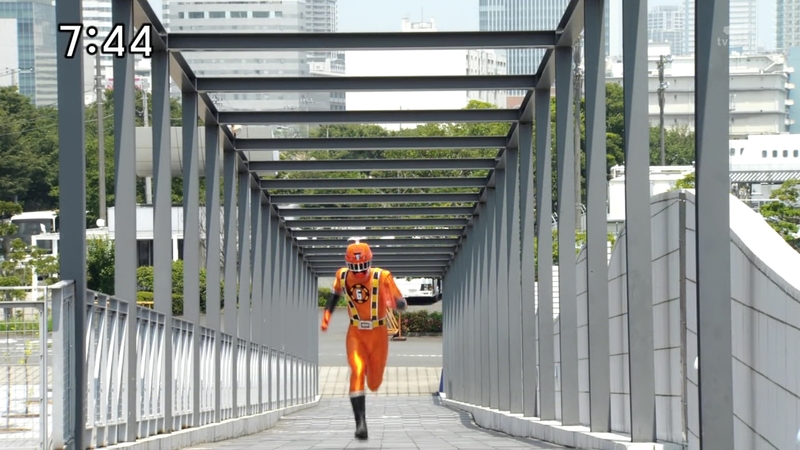 The ToQgers take care of all the feathered people while Akira runs across the city. 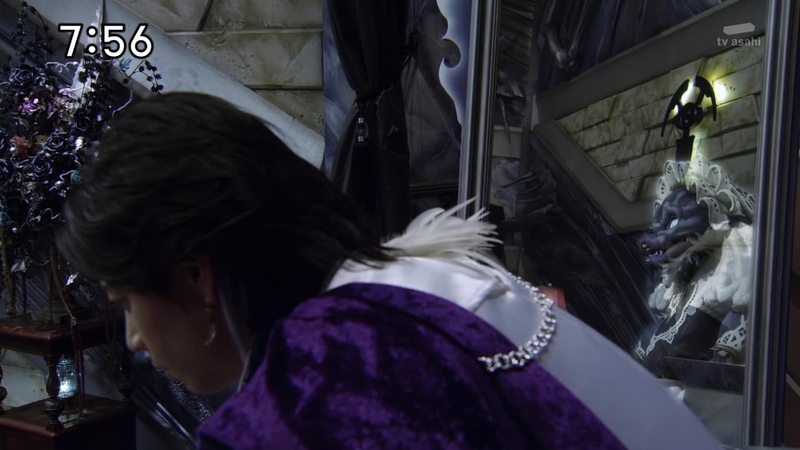 Back at the Castle, Zett asks Marchioness Mork what she meant about his weakness. She tells him it’s the shining and sparkling he’s so interested in. It would fine if he was really able to absorb it, but it’s no different than a fly being drawn to a flame. She warns him not to get sucked in by the light, especially the Rainbow Line. While walking, Tokacchi apologizes about what happened earlier. 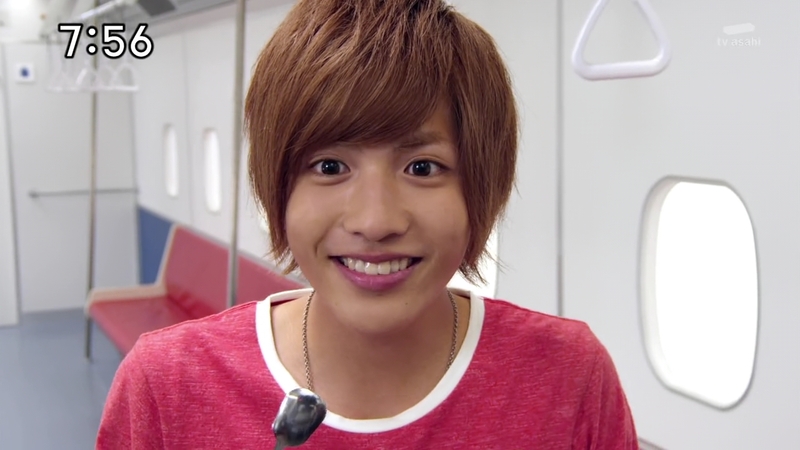 But Hikari says it didn’t bother him since Tokacchi’s known about him not liking vegetables since forever. Sure, Tokacchi says. But Mio sure is nice to Hikari, like trying to get him to eat his vegetables in a creative way. Hikari wishes she’d stop that though and Tokacchi again mentions how close they appear to be with each other. Tokacchi says it’s nothing, but Hikari appears to know what it is. Tokacchi fuh-reaks out and goes Looney Tunes right off the side of the hill. He tries to compose himself and says he was just a little envious, but not jealous. “You’re being annoying again,” Hikari says. Back on the Resshas, Mio and Kagura are struggling over how to take on Right. Wagon says they’re being too serious and suggests they take things a little more lightly. Akira flails his way to the park where Madame Noire and Right are, but he’s already exhausted and decides to call the others to take care of the situation instead. 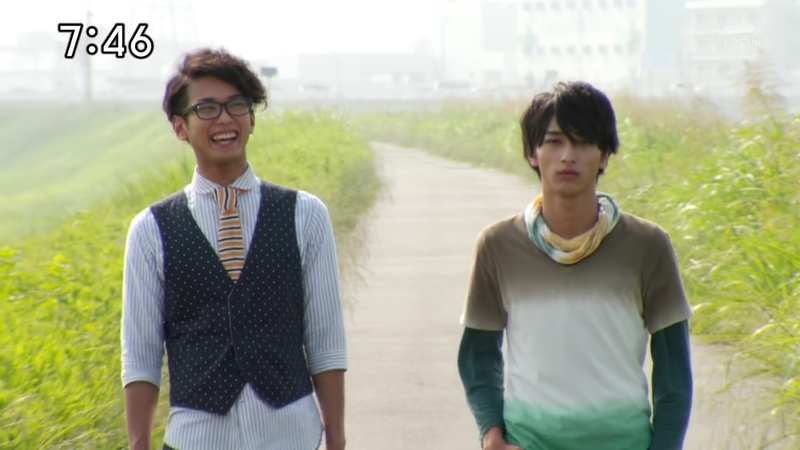 “Let’s go,” Hikari says to Tokacchi who makes his way back up the hill. Tokacchi apologizes for being a dork and showing his embarrassing side again, not that he was ever cool though. Hikari says he could never loosen himself up like that. He always appears cold or harsh. They both laugh and hurry over to join the others. Madame Noire alerts Right to the arrival of his friends. 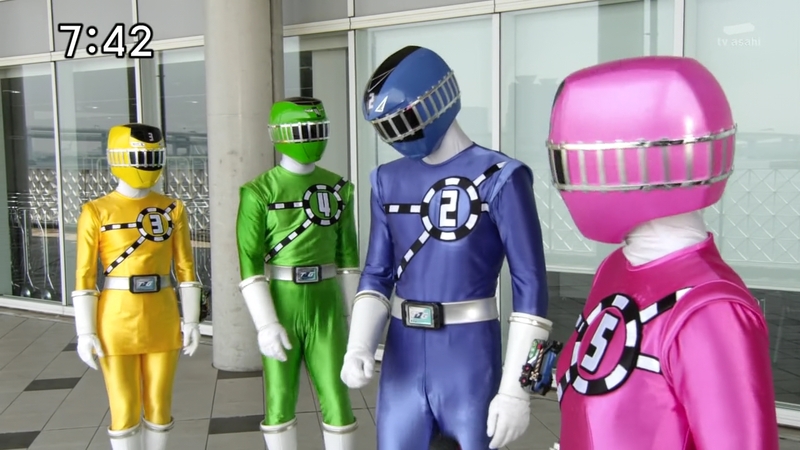 The ToQgers think about Wagon’s advice: There’s always been things you wanted to say to Right’s face. Remember them and just do it! 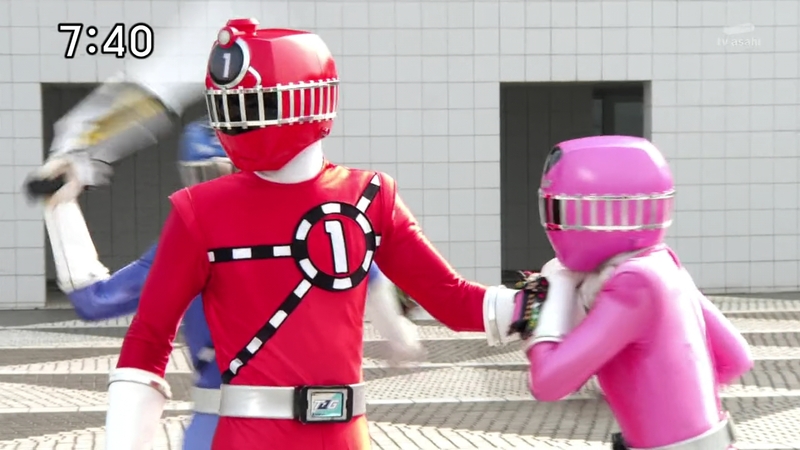 They henshin and charge straight toward Right as Madame Noire happily laughs at the start of this show. 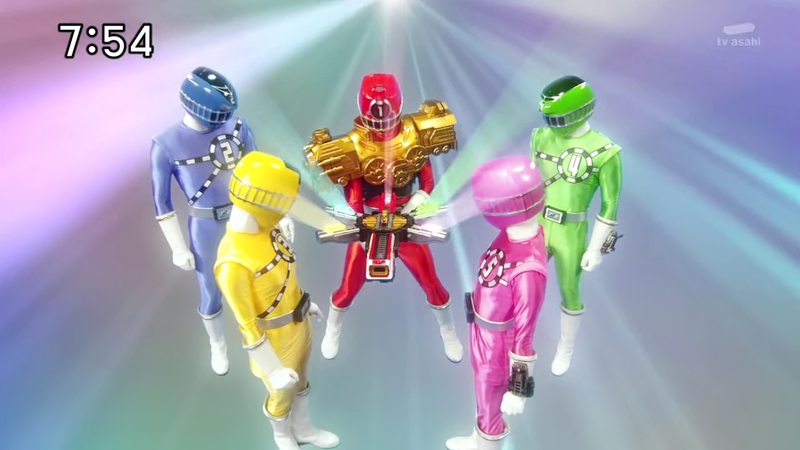 The ToQgers are resolved not to hold back against Right any longer. Tokacchi remembers Right squirting milk into his face and then laughing at him. Hikari remembers Right ruining his favorite kendama. Kagura and Mio remember Right walking around in just his underwear. The four of them then deliver a final kick simultaneously and Right is knocked to the ground, giving Tokacchi the opening he needs to grab the feather. Madame Noire wants to pay them back for ruining her fun so she uses her umbrella to send a huge fireball their way. The four ToQgers are now at their limits after just having gone all out on Right. Right decides to go Hyper to fight off Madame Noire himself. They go toe-to-toe until he knocks her towards a tree. She grabs onto a branch and sets herself back on the ground to summon her Kuliner and speed off. Two Kuliner Robos arrive and an awake Akira immediately jumps into Build Dai-Oh. 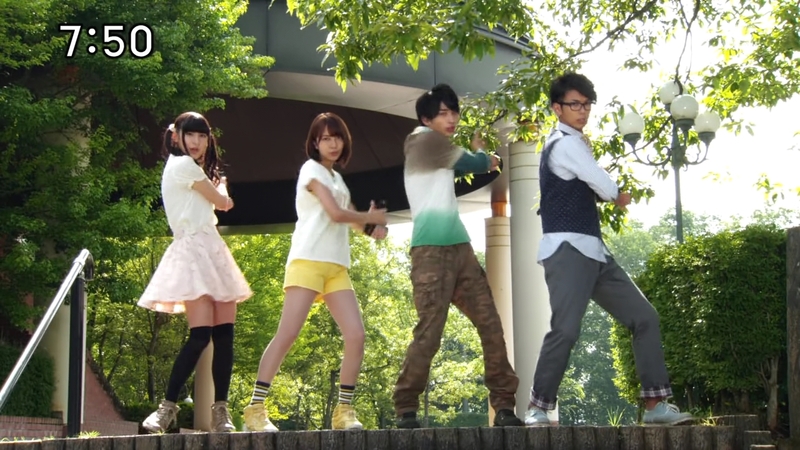 The five ToQgers sit and watch, but Right has an idea. He summons the Daikaiten Canon and is about to fire it himself when Kagura stops him. 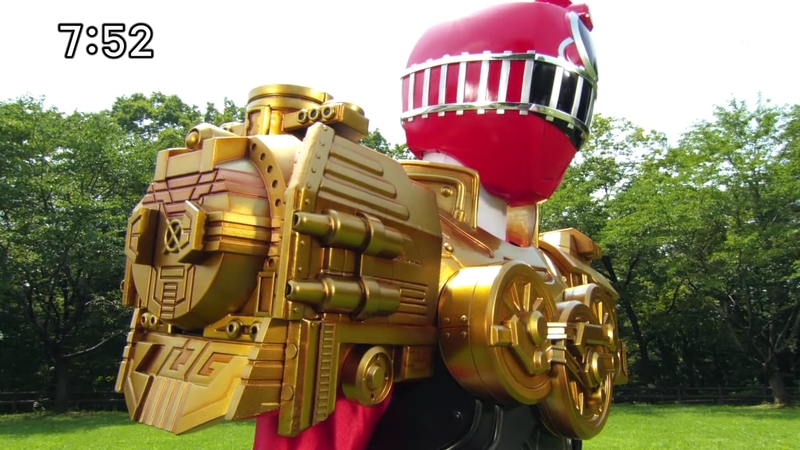 Sure, Right says and each of the ToQgers insert their Resshas onto the cannon’s tracks, sending their energy into the Hyper Ressha. Their combined powers allow them to deliver a 5 Renketsu Shot Fire which takes out both Kuliner Robos. 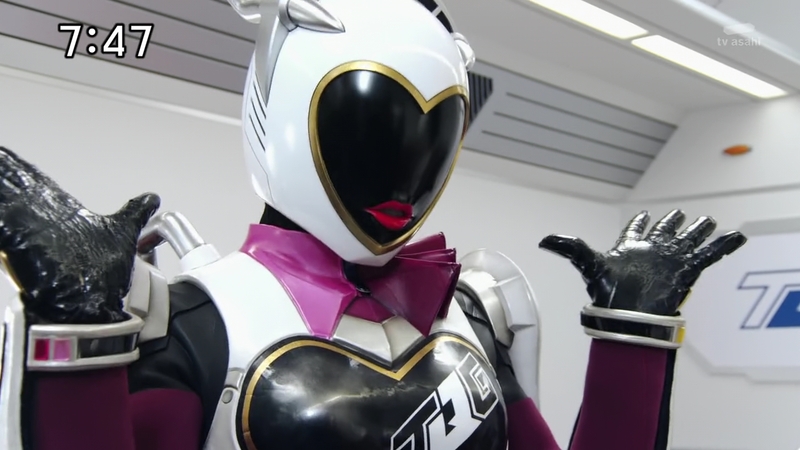 The ToQgers are back on the Resshas with Mio serving some of her homemade pudding. Mio takes one and offers it to Hikari who says he’s okay and to give his share to Tokacchi. Tokacchi jumps up and says he’s already got one. He quickly takes Hikari aside to ask him to give him some time and to not tell Mio. Right excitedly comes over, wanting to know what the two guys are whispering about. 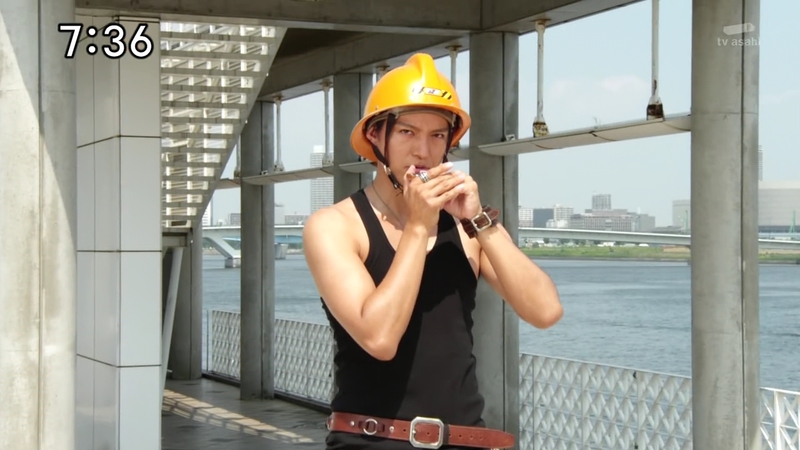 “Especially not to the other nuisance,” Tokacchi says. Hikari turns and says he wants to treat the girls to a barbecue feast. Tokacchi thanks Hikari and Right excitedly tells the others about the barbecue. Conductor and Ticket come in and Hikari laughs, thinking about him always being the keeper of secrets. 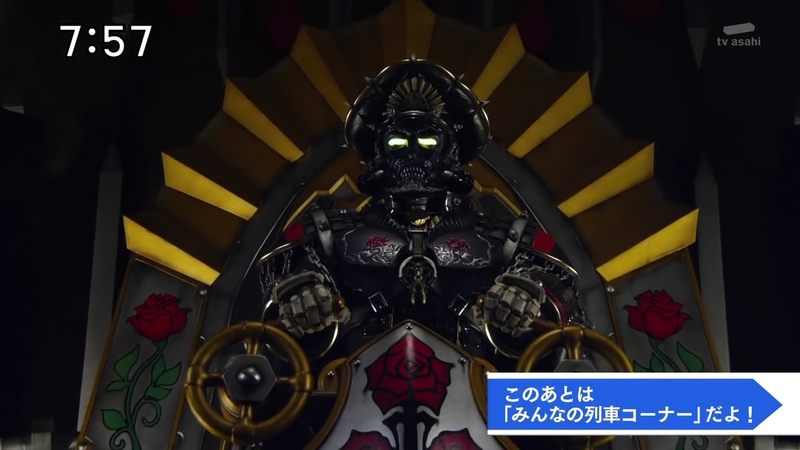 Meanwhile, back at the Castle, Zett is sitting on his throne when Madame Noire sees Gritta’s reflection again in the mirror. There’s no doubt about it now, Noire says, “His Majesty hasn’t fully absored Gritta. Zett thinks about Marchioness Mork’s words about his weakness while somewhere in the forest, Schwarz is getting ready to revive his Kuliner. This was a lot of fun. 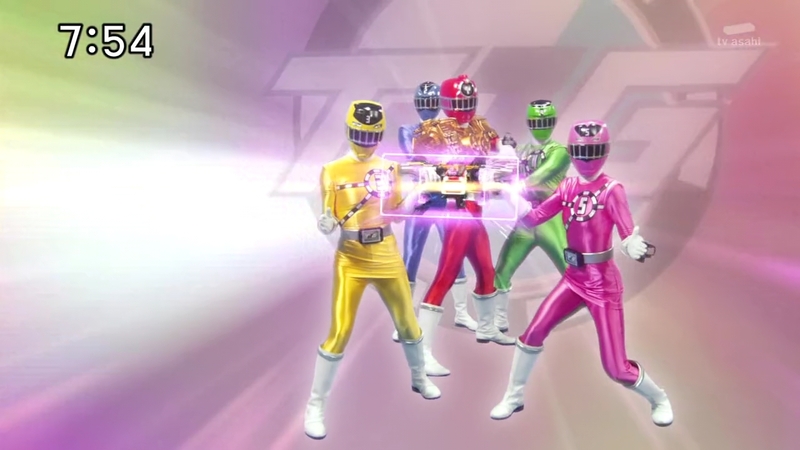 What the show has done very well is show and reinforce the ToQgers’ friendship and bond in many different ways. This episode was another one with Hikari and Tokacchi understanding each other and their own shortcomings. At the same time, they understand what they mean to each other, sort of like a “You complete me”-kind of way. And that’s applicable to all five of them. They each complement each other so well. 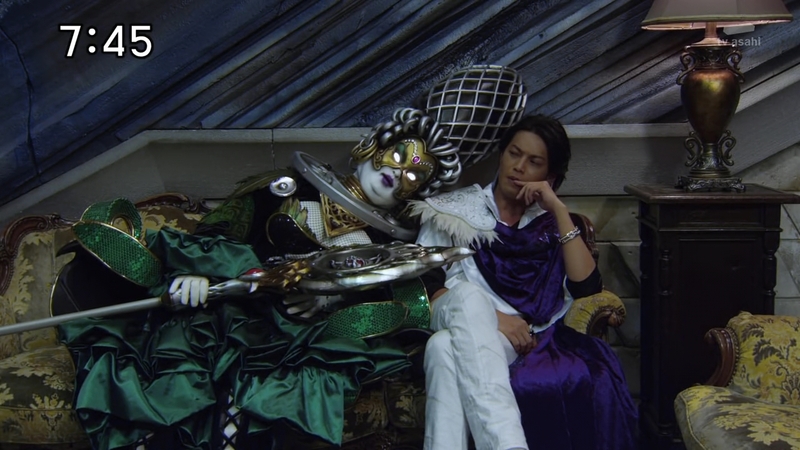 My romantic at heart-self loved seeing Tokacchi’s jealousy hilariously play out the entire episode. 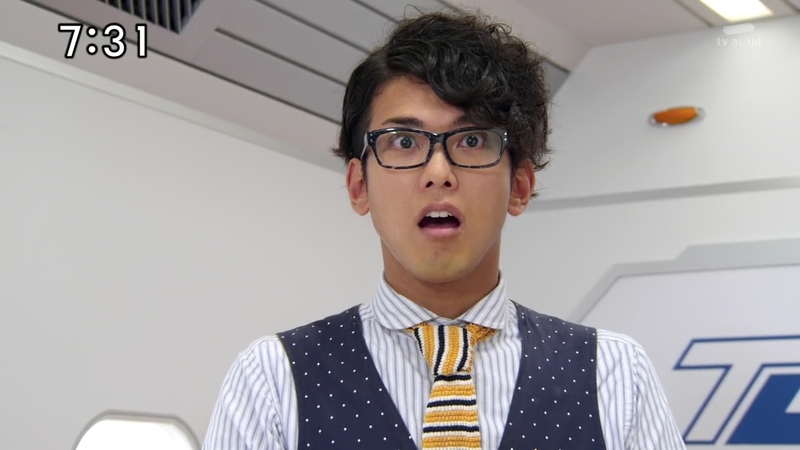 I’m glad they Kobayashi is developing Tokacchi’s feelings for Mio instead of just dropping it. The addition of Marchioness Mork definitely adds more to the infighting and jockeying for position within the Shadow Line which is always great. But it was even more awesome seeing Madame Noire in extended fighting scenes. We were so cheated out of the Noire-Nero battle. But it was nice to see her in action in this episode. I loved seeing her grab on to the tree branch when Hyper Right sent her flying. And of course Akira’s flailing about to his place of death. So random, yet so hilarious. That was a little disturbing. Like legit ZOMGWTF. That guy was about to smash that little girl’s head off and he proceeded to kick Right as he shielded her. Right was also brutal to Kagura too. He gutpunched her several times. Damn! lol yeah that Looney Tunes fall as funny. And yay Tokatti-Mio! I’m happy they’re continuing their story and not dropping it like other seasons. I just hope that they do the same thing for Hikari and Kagura because they’re just doing hints around them. I’m kinda glad that Hikari forgave Kagura for breaking his kendama in episode 7 because Right breaking it and Hikari getting pissed. That scene is proof that Hikari may a crush on Kagura because Hikari didn’t forgive Right but Hikari did forgive Kagura in episode 7.